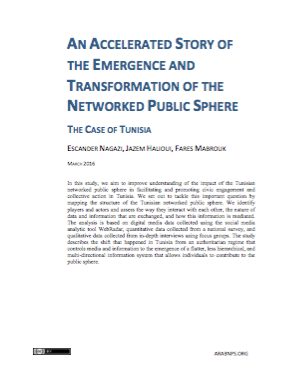 In this study, we aim to improve understanding of the impact of the Tunisian networked public sphere in facilitating and promoting civic engagement and collective action in Tunisia. We set out to tackle this important question by mapping the structure of the Tunisian networked public sphere. We identify players and actors and assess the way they interact with each other, the nature of data and information that are exchanged, and how this information is mediated. The analysis is based on digital media data collected using the social media analytic tool WebRadar, quantitative data collected from a national survey, and qualitative data collected from in-depth interviews using focus groups. The study describes the shift that happened in Tunisia from an authoritarian regime that controls media and information to the emergence of a flatter, less hierarchical, and multi-directional information system that allows individuals to contribute to the public sphere.